Sme 3012 R | What's Best Audio and Video Forum. The Best High End Audio Forum on the planet! Why 3012 is so special? It doesn't get in the way or homogenize the sound of the music it is transmitting. I'm a big fan. The knife edge bearing has something to do with it I think. David would be the best one to describe it's sound and how it compares to the myriad of other arms out there. Let's put it this way. When I was at David's house for 4-5 days and heard all of his turntables all of which could accept multiple arms, when he set them all up, I will never forget when he brought a huge handful of arms out of his supply room . He must have had at least 6-8 arms and every one was an SME 3012R. Inn David's comments to me he stated that over the years he has used most every tone arm and it is only the SME3012R which he has found to be the "MOST NATURAL SOUNDING". And we all remember David's mantra..."above all else it must sound natural"
Christian, you must have read many comments in Ron's thread today regarding resolutio, details, high extension and all that. One question to you. Do you miss any of these and hearing less with the 3012R while not homogenizing sound? I am also interested in this Saec and await to hear your feedbacks Gian. IME most elusive elements of reproduction are bass, sense of space and portrayal of scale to get right if you want "natural" and this is where the 3012-r is unmatched by any other tonearm I've owned and heard. Everything is just right with this arm. Ergonomically it's sensible and flexible I can set one up with just a protractor in under an hour from start to finish. The bayonet mount gives you the most possibilities and until Steve's visit it was readily available and inexpensive, prices have doubled since ! I would say except the price. It seems like if they should be so popular they could mass produce them and still make a killing for a lot less. They are just so simple, and lack exotic materials. Frankly it's super annoying how inflated prices get because something was discussed on this forum or another. Sometimes it's just like... can't people who can buy the very expensive stuff, enjoy it, and let some of us whom simply are not looking at $30k tonearms have the other stuff? My NOS 3012R bested several good arms in my system including an Ikeda, SME V, SME 12, etc. I also have about 10 cartridges and can change them in literally 5 minutes. Also, it gives you access to SPU's. No need for multiple arms when you can listen to all your cartridges so easily. and until Steve's visit it was readily available and inexpensive, prices have doubled since ! ..The 308 is a VERY aggressive version of Stevenson. IIRC, it can be 'improved' be lengthening overhang slightly but anything remotely close to what is in the manual will be strange. The other longer tonearms are better but there is in all cases a leaning towards Stevenson-type alignment. The 308 series really almost seems like the geometry is meant for playing old SPs. For many Japanese after-market arms, it helps to remember that a) the innermost groove according to the Japanese standards (JIS) were a few millimeters closer in (57.6mm) than IEC (60.325mm) standards prevalent at the time (and I think SAEC aimed more at 55-56mm, which would have put it halfway between EP and LP size for JIS at the time), and b) in the 1970s, expensive after-market tonearms were for older people who played vinyl, and that was mostly aimed at people who listened to classical music, which has more potential for significant dynamic changes (raging tympany and cymbals) at the very end of the piece. The other SAEC arms are basically some kind of modified Stevenson. The 407/23 and the 407TM (which had a slightly different geometry) were 'better' but still not great with SAEC geometry. But they can be 'made to work' reasonably well. 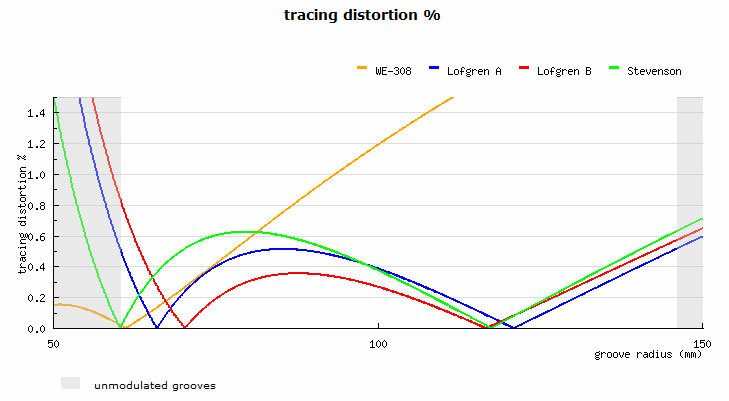 The 506/30 can be really great using slightly different parameters (and leaning towards a Stephenson, or a slightly modified Baerwald (because lowest average distortion/TE is great in theory but does not take into account the differences between records, especially those with higher natural dynamic range (i.e naturally higher stylus velocity in the groove) at the end of the side). The 8000ST is perhaps the 'most normal' geometry, but it is stupidly expensive these days. Personally, I find the most interesting aspect of SAEC tonearms is the way that their resonance can either match or not match a mounting or a material. They are VERY good on tables with metal plinths, or extremely hard-surfaced plinths. They are less good on tables with slightly softer material for a plinth or mounting board. This is not the end of the story. You can make this or any other Japanese arm with oddball geometry arm attain a normal Lofgren A or B alignment simply by twisting the cartridge in the headshell and adjusting overhang. In the case of this WE-308L you need only twist the cartridge about 8 degrees clockwise and provide about 10mm of additional overhang, maintaining the original pivot to spindle distance. These adjustments will give normal alignment. If you have an SPU, then forget it. I still don't believe that SME would drop the 3012 and then start making inferior arms with no connections between the headshell/arm. I don't either Bruce, but David says that the SME V was developed for the popular tables of that time which were light weight suspended belt drives. I don't really know, but I would love to directly compare the two SME 12" arms someday. I'm sure that they will sound different from each other. Current SME arms and tables seem to be out of favor these days, at least here in the US. My 30/2 is definitely not “lightweight”!! Exactly; then the quality shines through.. With the 506, 4 degrees is all that is required to achieve optimal alignment, overhang can stay at SAEC spec and eff length 295mm.. I have the template for this, and laser engraved acrylic disc. Balanced Power ~ 'Symetrica' by Z:Axis Audio TT Sony TTS 8000 / SAEC WE-506/30 / Nasotec Swing / Aidas PanzerHolz/ My Sonic Lab, Allnic H3000 Phono /KR Audio 'Lampi Anniv 5U4G CD Ayon CD-T / Stratos Ref DAC / Concert Fidelity 080LSX2 Pre / ZL200 Amplifiers / Martin Logan Spire - Extensively modified. Cabling is by Z-Axis Audio, Reference mains leads, 'Reference B52' interconnects, 'Livewire' speaker cables. Mirage equipment support. (...) Current SME arms and tables seem to be out of favor these days, at least here in the US. Many hundreds of SME 30's and thousands of SME V's are daily playing in great systems. We can not expect them to match every system, but a few of the best sounding systems I know about in my country have SME turntables. However the competition is really hard, there are many brands of excellent turntables that currently represent great value for money. WBF is a an extremely small niche of enthusiastic and knowledgeable people, but IMHO we can not extrapolate from our group findings.